As many readers of this blog will know, consulting company Opticos has been engaged as the City of Austin’s consultant in the re-drafting of our Land Development Code, a process known as CodeNEXT. Early in the process they tipped their hand and indicated that the current land use codes and regulations by and large prohibit “Missing Middle” housing types. We tend to get high rises in downtown, a few midrises on the transit boulevards and a whole lot of single-family detached housing units everywhere else. We have nearly coded out (or greatly limited) the once common duplex, triplex, fourplex, bungalow court, row house, court yard apartment and live/work units that were a part of the essential fabric of the urban residential neighborhoods. One huge advantage of Missing Middle housing types is that they offer a way to incrementally layer in density without imposing large structures on neighborhoods. The building mass of Missing Middle housing is similar to or compatible with single-family detached units, but make better use of largely wasted space. Austin is a young city, mostly post-war, that came of age when distances began to spread out with the widespread adoption of, and increasing dependence on, the automobile. It is also the era when row-houses became de-classe. They were oft “associated with overcrowding, lack of light and air and open space, architectural monotony and other environmental defects.” About this time our city codes became increasingly complex and imposed zoning restrictions designed to prevent such structures from being built at all. The result of this trend is that Austin is almost (not quite as we’ll discuss below) completely devoid of this type of housing structure. Vestiges of a bygone era? 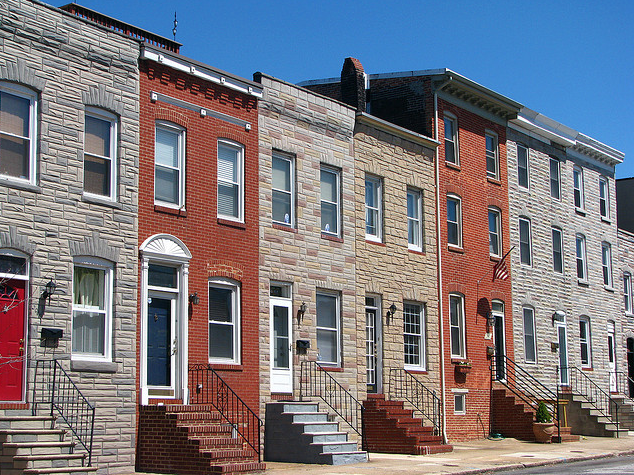 There are a lot of benefits to row houses and, as a result, they’re enjoying a resurgence in interest and popularity. Row houses are a medium-density housing type – about 25 units per acre or so are possible with row houses. Compare that with typical single family houses (SF-3 zoning) where no more than 6-7 units per acre are possible and sometimes as low as 4 units per acre with ¼ acre suburban lots. Austin is a low density city and should be looking for the next incremental way to evolve. Because row homes are fee simple, they offer an attractive and efficient alternative to the single-family detached home (i.e. side walls aren’t attached to one another) that predominates our landscape for people who want the control of owning their house but don’t need or want the additional space of a large yard to maintain. As an example of the cost savings that can be achieved by row houses, we bought into Mueller and the primary reason we were able to do so is because we could purchase a row house. To build our row house as a detached home would cost an estimated additional $25,000 in construction costs alone. The difference in land value is a bit of a guess – but a lot the size of the one our units sit on in a moderately priced central Austin neighborhood might cost $300,000. Considering that you could put 3 row houses our size on that lot means about $225,000 in land and construction savings per unit! That’s a substantial discount over single-family detached homes. Additionally, this is an investment that pays dividends to us every year because we’re not paying additional property tax on land valuation we don’t want and can’t use. We also save substantially on utility costs. Not only are the units energy efficient because of shared walls and fewer windows, we have a substantially smaller yard that requires little watering. David Whitworth, a central Austin infill builder, points out that the City is a winner as well. While my individual tax bill is lower, on the same sized lot that one might put a single-family detached house there are three owners each contributing property taxes to the city for the land attributable to it plus the structure that sits on it. In aggregate the three of us are returning more to the city than a single family detached home could on that same lot. And, the City, which pays to maintain utilities and roads by the linear foot, expends less over the long haul to service our needs. In the row house scenario – everyone wins. There are more units available and thus more people can live closer to their desired locations. Living closer means fewer and shorter trips, less traffic, and less congestion for everyone. The cost per unit is lower. The taxes per unit are lower, but the taxes collected by the City are higher. The City’s costs are arguably lower as well by not having to maintain roads and utilities and provide services over longer distances. The builder’s profit is higher which incentivizes more builders to build more lower cost units like this. We’ve added to everyone’s bottom line and made the city more resilient in the process. ** And the only thing we had to sacrifice was a bit of mostly useless side yards.Next Post: How rowhouses are–and could be–regulated in Austin. * While I saved about $225,000 in apples to apples terms using land and construction savings above, in reality, for the builder to see the same 20% return on the same lot, a detached home would have to be built much bigger, further increasing the cost disparity between the two housing models. ** Back-of-a-napkin-calculation time: Extrapolating – under the above example each acre of land developed as row homes would return about $158K/year to the City whereas the same property developed as single family detached homes would just $114K/year in ad valorem taxes. Extrapolating further – each square mile so developed would return an addition $27M. annually to the City over the same area developed as SF detached homes while simultaneously lowering household tax burdens to 3,900 families. Food for thought.